DID YOU KNOW THAT kids who grow up doing chores are guaranteed to have higher self-esteem and enjoy more success in life than those who don’t? Getting our children involved in household tasks instills in them a sense of responsibility and belonging making them better equipped to deal with frustration, delayed gratification and the realities of the “outside world”. It gives them a sense of pride and satisfaction to know that in one way or the other, even in the smallest way possible, they are able to repay us for all we have done for them. This kind of attitude is what helps them become successful students and individuals in the future. Luckily, I’ve discovered KIMY Ice Cream and their #CoolReward Chart! I love crossing things off my to-do list and this is similar to that! Just in the same way that salary motivates us to work, we can help encourage our kids to help us out by rewarding them with a cold and refreshing KIMY Popsicle after they complete a household chore! Unlike other treats which tend to be overtly sweet, I don’t mind occasionally rewarding her with KIMY because their popsicles are made specially for kids, having the right amount of sugar, salt and fat for the little ones. This is speaking as a person not so fond of sweets, mind you! But KIMY, I can’t resist. I just find them super irresistible! Like a frozen slushie on a stick! KIMY Jelly Tongue, for example, when you get down to the jiggly gelatin heart of it, makes for a really fun treat that my daughter and I can enjoy together on the “now clean” floor! 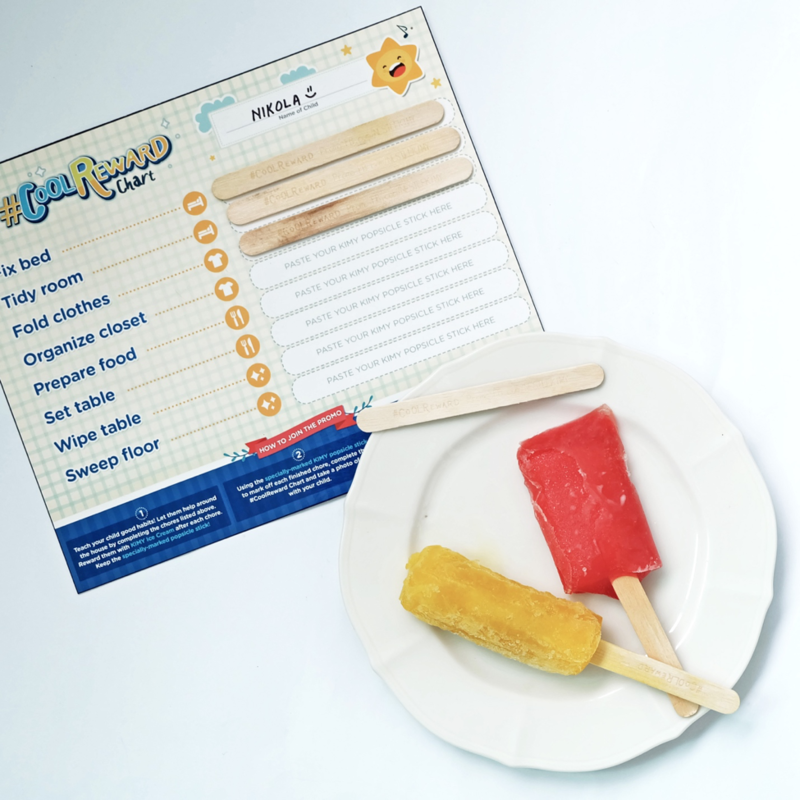 And aside from being an enjoyable treat, your kid gets to cross things off the KIMY #CoolReward Chart by sticking specially marked popsicle sticks on top of tasks they’ve already accomplished! BUT WAIT THERE’S MORE! Parents get rewarded too! KIMY is giving away LED TVs with a Home Theatre System and a NESTLE Ice Cream Party Package for when your kid completes a #CoolReward chart! 2. Reward your kids with KIMY Ice Cream whenever they complete a chore from the list, and paste the specially-marked popsicle stick on the chart to mark it off. 3. Take a photo of it with your child and upload it as a photo comment at fb.com/NESTLEKIMY!